Many different cultures treat developing good character as one of the central challenges in human life. Your character draws together strengths that help you to pursue and promote good reasonably, avoid bad responsibly, and participate in the collective movements toward common good that shape the social world in which you find yourself. Good character is, as one says, a proof against rewards–a good person does not, for instance, betray her friends or her firm for the sake of personal advantage. Good character is supposed to help people set their priorities, to think well about good courses of action they might pursue here and now, experience sorrow over genuine losses, joy over real triumphs, and more generally to live wisely and well. How has your own character been shaped? In what ways do you expect that support for character development might be hard to come by in the next decade? What rhythms, practices, or institutions might you engage and rely upon to help you move forward on a path to strong character? 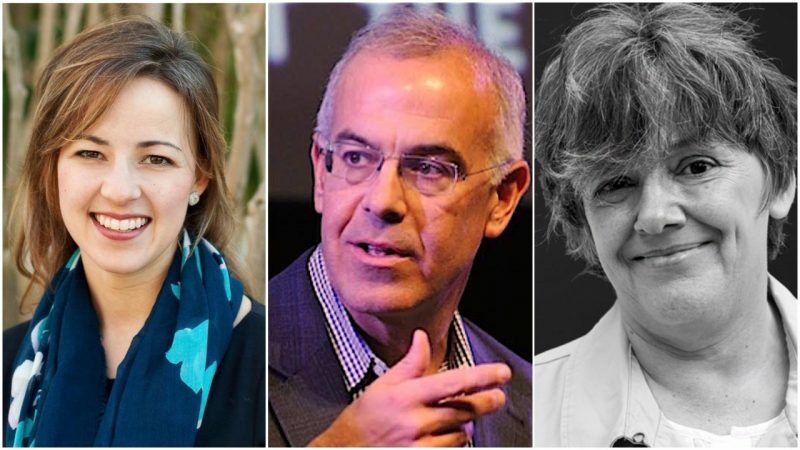 David Brooks, Anne Snyder, and Candace Vogler hope that you will join a conversation about character. Seminar Time: 10 a.m. – 3:30 p.m. Participation: To take part in the seminar, please complete the application below by April 14th. David Brooks became an Op-Ed columnist for The New York Times in September 2003. He is currently a commentator on “The PBS Newshour,” NPR’s “All Things Considered” and NBC’s “Meet the Press.” He is the author of “Bobos In Paradise: The New Upper Class and How They Got There” and “The Social Animal: The Hidden Sources of Love, Character, and Achievement.” In April of 2015 he came out with his fourth book, The Road to Character, which was a #1 New York Times bestseller. Mr. Brooks also teaches at Yale University, and is a member of the American Academy of Arts & Sciences. Anne Snyder is the Director of The Character Initiative at The Philanthropy Roundtable, a pilot program that seeks to help foundations and wealth creators around the country advance character formation through their giving. She is also a Fellow at the Center for Opportunity Urbanism, a Houston-based think tank that explores how cities can drive opportunity and social mobility for the bulk of their citizens. Prior to jumping to the Lonestar state she worked at The New York Times in Washington, as well as World Affairs Journal and the Ethics and Public Policy Center. She holds a Master’s degree in journalism from Georgetown University and a B.A. in philosophy and international relations from Wheaton College (IL). Anne has published in National Journal, The Washington Post, The Atlantic Monthly, Philanthropy Magazine, Orange County Register, Center for Opportunity Urbanism, The Institute for Family Studies, FaithStreet, Comment Magazine, Verily, Humane Pursuits, and FareForward. Candace Vogler is the David B. and Clara E. Stern Professor of Philosophy and Professor in the College at the University of Chicago, and Principal Investigator on “Virtue, Happiness, and the Meaning of Life,” a project funded by the John Templeton Foundation. She has authored two books, John Stuart Mill’s Deliberative Landscape: An essay in moral psychology (Routledge, 2001) and Reasonably Vicious (Harvard University Press, 2002), and essays in ethics, social and political philosophy, philosophy and literature, cinema, psychoanalysis, gender studies, sexuality studies, and other areas. Her research interests are in practical philosophy (particularly the strand of work in moral philosophy indebted to Elizabeth Anscombe), practical reason, Kant’s ethics, Marx, and neo-Aristotelian naturalism. Please complete the application below by April 14th. Notifications of accepted participants will be sent by April 21st. For the statement of interest, please include a description of no more than 400 words explaining why you would like to take part in the seminar and what you hope to gain from it.